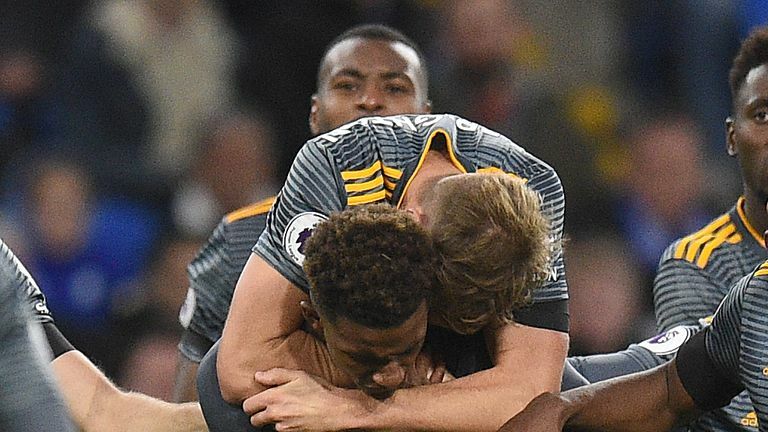 Phil Thompson believes referee Lee Probert should "hang his head in shame" after booking Demarai Gray for his celebration in Leicester's 1-0 win at Cardiff. Gray claimed the 55th-minute winner and took off his shirt to reveal a 'For Khun Vichai' top underneath in memory of owner Vichai Srivaddhanaprabha, who was among five people killed in a helicopter crash last weekend. Goalkeeper Kasper Schmeichel ran the length of the field to join the team celebration. Probert showed the winger a yellow card in the ensuing celebrations - the correct call under protocol - but Thompson believes the referee should have taken the circumstances into consideration. 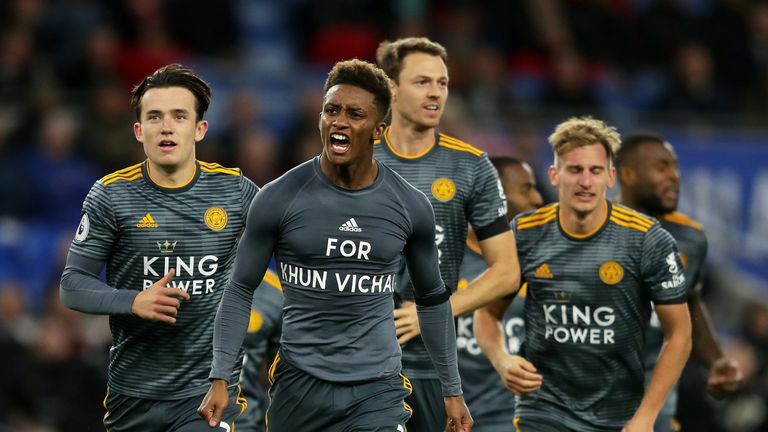 Leicester's Demarai Gray was booked by Lee Probert after scoring the winner against Cardiff and taking off his shirt to reveal a 'For Khun Vichai' top underneath in memory of owner Vichai Srivaddhanaprabha. He told Soccer Saturday: "Gray celebrates by taking his shirt off, and in all the emotion, Schmeichel comes up from the other end and they're in front of the Leicester fans. "They're jumping all over each other, and Gray takes his shirt off, to reveal a tribute to his chairman and Lee Probert books him. "Hang your head in shame. I know they have rules, but do me a favour. Use your common sense. I'd rather take the criticism from the people who are above me than do what you've done in this game. "It was absolutely shameful from him, and he made a mistake just before half-time, because Jamie Vardy gets his shot away and Sol Bamba handles the ball on the goal-line. It was so easy to see, and it should have been a red card and a penalty to Leicester. "He's had a shocker today." Srivaddhanaprabha and four others were killed when his helicopter crashed just yards from the King Power Stadium after last Saturday's game against West Ham. The Leicester players had conducted their pre-match warm-up wearing white t-shirts bearing an image of Srivaddhanaprabha accompanied by the words 'The Boss' - the title by which the Thai businessman was known at the club. On the back were the words 'Khun Vichai You Will Be Forever in Our Hearts', and the same t-shirts were worn by Leicester fans packed behind one of the goals. Cardiff laid a wreath before kick-off and a minute's silence was impeccably observed as the entire Leicester staff joined the players on the centre circle to pay tribute to Srivaddhanaprabha. "I'd like to congratulate both sides and both sets of fans," Thompson added. "It was difficult for everybody and you could see it in the players. You knew the Leicester players would be emotional and you could see it at the start of the game. 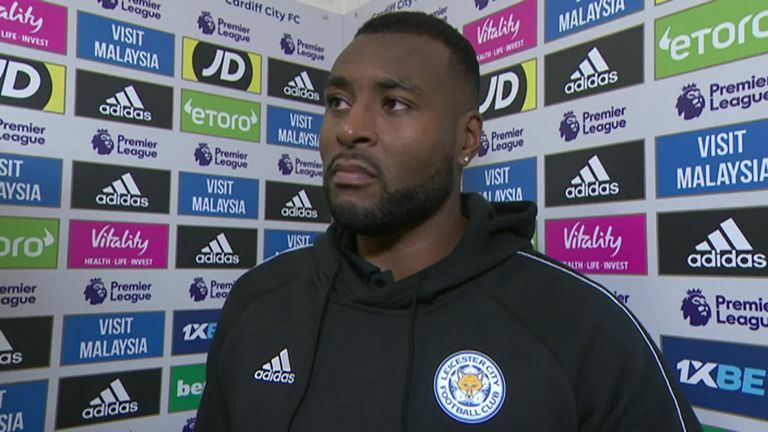 "Cardiff went for them and from a footballing side, if they were going to take advantage that was their best spell, but Leicester stayed strong and they came through it. "It was not a bad match considering what went on, and all the talk about things besides the football, and that's why I thought this was quite exceptional. "This was an excellent performance from everybody at Leicester and there was a lot of raw emotion out there."